Probably you’ve read enough food blog posts about Porchetta that your sick about reading it. Well, I’m one of those pesky bloggers who would jump ship to try something relatively new. I’m not saying I’m trying everything new for the sake of being “hip” but more of the idea of loving to get my hands on an awesome sandwich. What made me travel all the way down to East Village from the Upper East Side was for the love of pooorrk. Don’t you know I love pork fat (or any animal fat)? Last week I’ve taken the downtown 6 train and waddled my way over toward First Avenue to Porchetta. 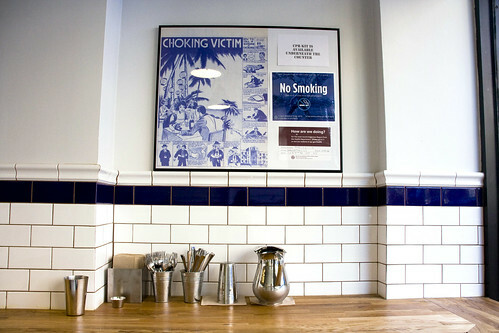 Entering upon the minimalist interior of mostly white and blue-tiled walls with an intriguing version of the first aid choking victim poster, and blonde wood bar as counter seating with matching stools. 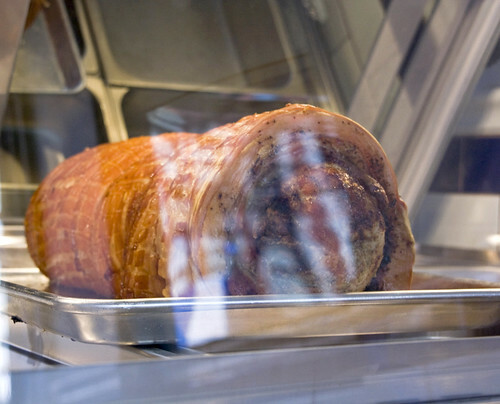 But the centerpiece is when you glance at the glassed-stainless steel oven, encasing the large hunk of porchetta. Glancing upon the short menu of a porchetta sandwich ($9), a porchetta platter ($12) with a side of beans and greens sans the roll, a few sides a la carte, and biscotti for dessert. I’ve asked for the crispy skin potatoes but they didn’t have any available since they haven’t gotten their shipment of potatoes. Pooh. 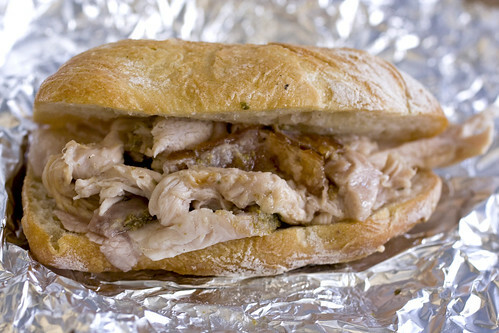 So, I’ve just ordered their porchetta sandwich (like everyone else in the NYC food blogosphere is doing). 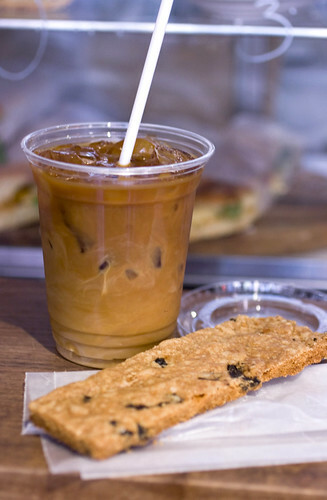 But when you do have the urge to have dessert and coffee to cap off your meal, you can head over to Abraço and get their addictive cured black olive cookie and robust iced coffee. Angela: I LOVE that cookie! It’s in a special place in my heart (besides macarons, my true love and obsession).